There can be no more unlikely – or loveable – brand ambassador in the world. Meet Rocky the Rockhopper penguin, a rescued waif of a seabird who now lives at SANCCOB, and who garners attention from every visitor. There can be no more unlikely – or loveable – brand ambassador in the world. Meet Rocky the Rockhopper penguin, a rescued waif of a seabird who now lives at SANCCOB, and who garners attention from every visitor. She, and yes, Rocky is a ‘she’, was caught in the fishing nets of a trawler, and was fortunate enough to be brought to SANCCOB for rehabilitation. Rocky is a long way from her preferred subantarctic waters of the Indian Ocean, so she is more or less a permanent resident. SANCCOB, for those who might not be aware, is a 24-hour seabird rescue centre, and they will respond to all seabirds in distress, performing an invaluable conservation service currently. But Rocky the brand ambassador? Boston Breweries, one of the Cape’s longest standing and most prestigious craft breweries have coincidentally just launched Rock Hoppa beer, their latest addition to a series of great craft beers. Chris Barnard, Managing Director of Boston Breweries, is a man of the sea. Sea swimming is his true passion, and he has numerous Robben Island swims to his credit, including the almost unbelievable pioneering feat of completing the swim employing only butterfly stroke. The local penguins would have been impressed. Chris admits that Rock Hoppa beer was named initially for the strong hops presence in the brew, but he quickly realised that his love for nature, the sea, and his beer had a great synergy: enter SANCCOB, Rocky and a great partnership. SANCCOB are the unsung heroes of the Western Cape sea and bird life. Their unremitting efforts to rescue stricken birds and release them in their natural environment gets publicity during oil spill crises, but what is not often realised by the public is that SANCCOB are continually rescuing birds and penguins, and they are dependent on that public for ongoing funding. 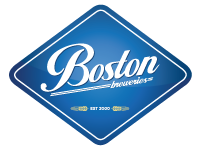 Boston Breweries, Chris Barnard and Rock Hoppa craft beer have come up with one solution. Chris has decided that for every bottle of delicious, hoppy, Rock Hoppa beer sold, R1 (yes, one Rand) will be donated to SANCCOB. Chris and Jacqui Barlow, marketing manager of Boston Breweries made a pilgrimage to SANCCOB to present the idea, met Rocky, fell in love, and a unique brand ambassador was born.